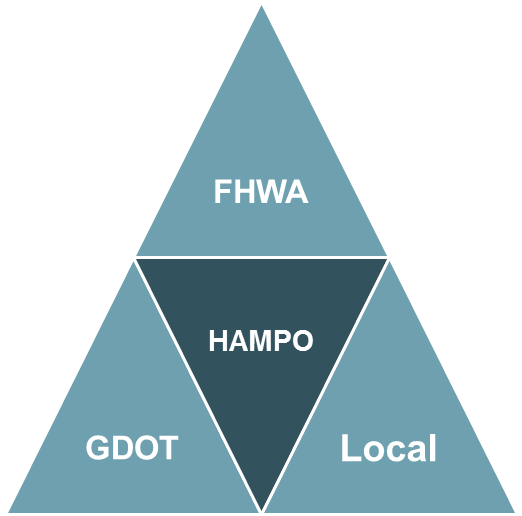 HAMPO is operated under the leadership of a Policy Committee, comprised of elected officials and other decision makers from each participating jurisdiction, the Georgia Department of Transportation, and other state and federal agencies. A Technical Coordinating Committee and Citizens Advisory Committee provide valuable input to the Policy Committee on transportation issues. 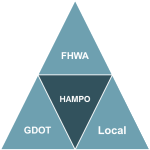 Use the links below to review the governing documents that create the framework for the HAMPO committees as well as the Federal, State and Local laws that govern the planning process. For additional information contact Nils Gustavson. All publications herein were prepared in cooperation with the Department of Transportation, Federal Highway Administration. The opinions, findings, and conclusions in these publications are those of the author(s) and not necessarily those of the Department of Transportation, State of Georgia, or the Federal Highway Administration.